Commercial performance. Home kitchen convenience. 1000 watts power up to 13,000 RPM for up to 30% more juice than traditional juicers. The cutting disc is so powerful that pineapple can be juiced in large chunks with the rind on. The easy-to-assemble parts can all be placed on the top shelf of the dishwasher (with the exception of the electrical base) for quick and easy clean-up. The dual speed motor can extract an 8 oz glass of juice in 5 seconds. Harder fruits and vegetables such as apples and beets can be juiced on high speed. Low speed is optimal for softer fruits and leafy green vegetables such as cantaloupe and spinach. MSRP $399 Based on the Manufacturer's Suggested Retail Price, this juicer is more expensive than average and is priced in the top 9% of juicers. Premium Features 5 When compared to other juicers, this appliance has more premium features than average and ranks in the top 7% of juicers. Higher Power √ Designed with an above average motor that can deliver extra power for juicing tougher fruits or vegetables. Also reduces wear and tear on your appliance. Multiple Speeds √ Allows you to adjust the speed to the toughness of the food. Lower speeds for softer foods like raspberries, and higher speeds for harder foods like carrots. Large Feed Tube √ Designed with a 3 inch or more wide feed tube that accepts whole foods such as apples. This feature greatly reduces the need to pre-cut foods. Pulp Ejection √ Automatically ejects the pulp into a separate bin, allowing you to continuously juice without having to periodically stop and manually remove the pulp. 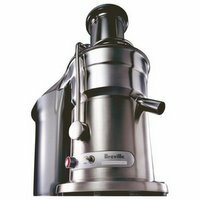 Motor Warranty 3 Years When compared to other juicers, this appliance has an average limited motor warranty. The motor warranty is a good indicator of motor durability. Star Rating 4.6 User reviews, ratings, and feedback indicates that this juicer is rated higher than average by 380 users and ranks in the top 13% of juicers.